Apple's entry into on-demand music streaming is similar to rivals Rdio and Spotify, but with some key differences like Beats 1 radio and iCloud Music Library. 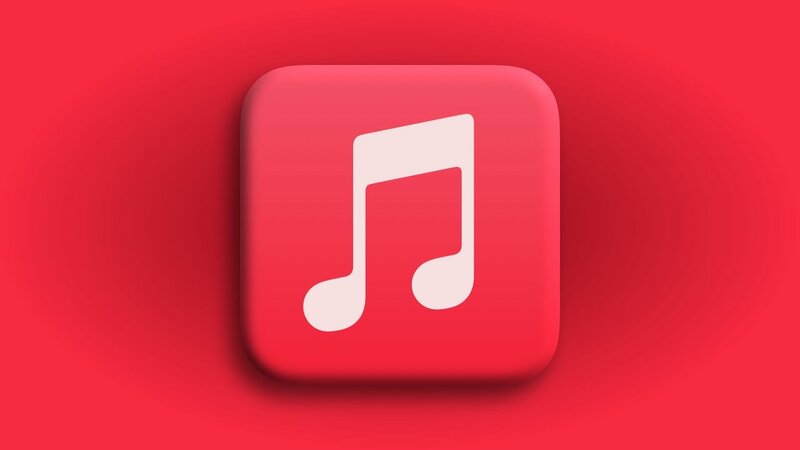 Apple Music is Apple's own streaming music service, providing access to a large catalog of songs and tracks that subscribers can listen to at any time. Subscribers are able to use iPhones, iPads, the Apple Watch, Mac, and the HomePod to access the service, as well as through iTunes on Windows, though notably it is also accessible on Android via one of Apple's rare apps for the non-iOS operating system. Despite being unified under the same label, Apple Music can really be thought of as multiple different services. As expected, at the center is on-demand streaming of songs and albums, which offers a number of perks to subscribers including curated playlists and personalized recommendations. One element, "For You," provides users with automatically generated playlists based on a theme, such as "My New Music Mix" and "My Favorites Mix." In June, Apple started to roll out a new addition to the list, with "My Chill Mix" slowly being rolled out to small subsets of users. These mixes are further customized to users based on their preferences, with the custom tuned playlist taking into account liked songs, favorite artists, listening histories, and other data. The mixes under the For You section usually update with new content for users once a week. The third branch, Beats 1, is actually a 24-hour radio station hosted by live DJs, with music, interviews, requests, and special celebrity shows. 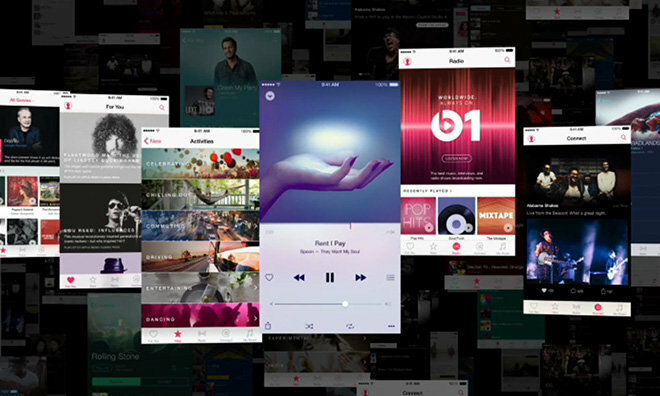 Apple Music Radio meanwhile is a reinvention of iTunes Radio, distinguished mostly by more curation of preset stations. So far, Apple has only launched Beats 1, but reports have alluded to the possibility of expanding into other beats "stations" in the future. In late 2015, it was discovered Beats Electronics had filed logos for Beats stations 2 through 5 and related station names. 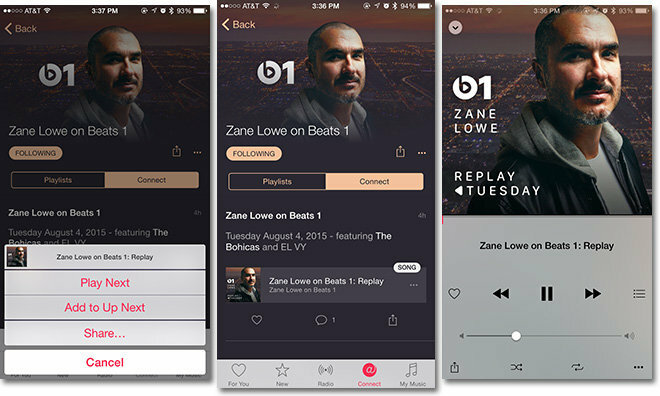 In March 2017, Beats 1 head Zane Lowe revealed in an interview Apple was still looking to grow the Beats station concept further. Connect is Apple's answer to social networking as it applies to music. The service comes with a one-way blog-style format through which musicians can share news, songs, photos, and videos. 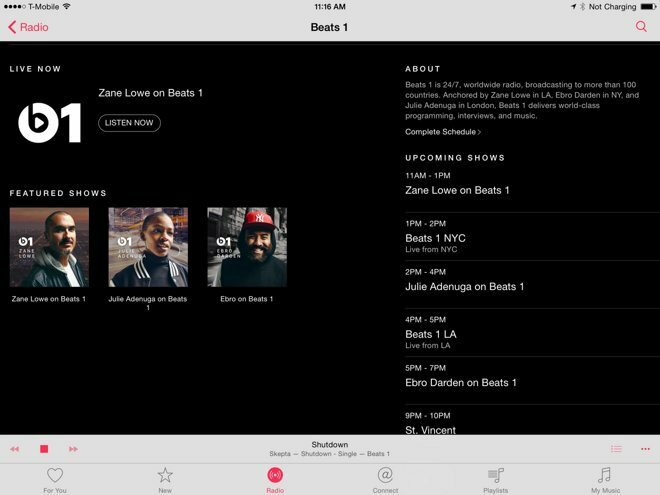 Apple is continuously building out Connect and most recently added a feature called Beats 1: Replay, which lets listeners play back recorded Beats 1 shows hosted by DJs Zane Lowe, Julie Adenuga and Ebro Darden. Subscribers can download songs, albums, and playlists to their device's local library for offline listening, a feature that can help users in areas with cellular blackspots continue listening to their music, as well as potentially reducing their cellular data plan's usage. iCloud Music Library is needed to add on-demand content to a personal library, and to cache those tracks for offline listening. The same feature can also be used to upload a local collection for remote listening on a different device under the user's ownership. Users have previously complained about a number of issues with iCloud Music Library and offline listening, with reports of track duplication, mislabeled songs, and rare instances where users suffered from a mass deletion of songs and playlists. Aside from providing music, Apple Music also offers subscribers access to a variety of video content. Searching under the "Music Videos" section under the browse tab brings up a selection of videos created to promote the music, as well as concert footage, interviews with the musicians, and other content. Apple is also planning to use Apple Music to host shows exclusive to the platform, a content strategy the company has reportedly been working on for quite some time. Similar to content from Netflix and Amazon Prime Instant Video, Apple Music will offer a collection of TV shows that you cannot watch anywhere else, with some content produced by Apple itself. Based on the segment from James Corden's Late Late Show on CBS, "Carpool Karaoke" has celebrities and singers driving around and singing together inside a camera-equipped car. Each show will be expanded from the short segment to fill 30 minutes, with the first 16 episodes featuring Corden himself, Will Smith, Alicia Keys, Seth MacFarlane, and stars from Game of Thrones. The show has become successful enough for Apple to renew "Carpool Karaoke" for a second season. Canadian TV host George Stroumboulopoulos has signed a deal for concerts from his house to be shown on Apple Music. The ten-part "House of Strombo" will feature bands playing in an intminate setting, crammed into a small space with the audience, with international legends and upcoming artists set to take part. The exclusive documentary "Can't Stop, Won't Stop" landed on the service in June, and will be exclusive to Apple Music for one year. Covering the rise of label Bad Boy Records and owner Sean "Puff Daddy" Combs, the documentary features interviews with industry executives, including Apple Music head Jimmy Iovine. Early reviews of the film have been critical, calling the documentary "shallow and dull," and a "vanity project strictly for the fans," though more positive reviews call it more "intimiate and revealing than these sorts of artist-approved self-mythologies usually are." Users of movie site Rotten Tomatoes have not been kind, with an early average rating of 2 out of 10, and a 43-percent rating on the "Tomatometer" based on critic reviews. Not all of the shows on Apple Music are music-related, with "Planet of the Apps" featuring developers pitching ideas for apps to a panel of mentors, in what could be descrived as The Voice meets Shark Tank. Successful applicants have a chance to work on their ideas and pitch to Lightspeed Venture Partners, which could help net up to $10 million in funding for the app. In February 2018, Apple was reported to have commissioned a drama called "Swagger," based on the basketball star Kevin Durant. Produced by Durant himself in association eith Imagine Television, the show will also look into the world of the Amateur Athletic Union (AAU) basketball and other players, families, and coaches. To further its video ambitions, Apple has hired former Sony Pictures Television executives Jamie Erlicht and Zack Van Amburg. The pair, responsible for shows such as "Breaking Bad" and "The Goldbergs" among others, are likely to use their expertise to help not only produce Apple-created programming, but to also forge deals with content creators and studios to add to the Apple Music catalog. In mid-December, Apple Worldwide Video reportedly brought aboard two more executives from other firms, with Philip Matthys hailing from Hulu and Jennifer Wang Grazier from Legendary Entertainment. The new managerial additions arrive ahead of Apple's expected foray into big-budget scripted TV shows. In February, Caroll Trussell was installed as the head of production for Apple's video efforts. Formerly the head of production for Gaumont Television since 2013, Trussell is listed as a producer of HBO's "True Blood," with additional credits including "Roswell," "Unnatural History," "What about Brian," and "Hannibal." Apple is expected to make video a bigger feature of Apple Music in an update to the app, thought to arrive as part of iOS 11 later this year. It is reported by Bloomberg that the update will make it much easier to discover Apple's original shows and documentaries. Analysis of spending on video by Loup Ventures suggests Apple is preparing go big in video content, with the report suggesting Apple will increase its outlay by an average of 54 percent every year until 2022, from an estimated $500 million in 2017 to $4.23 billion five years later. For comparison, the same report pegs Netflix and Amazon's spending at $3 billion and $1.5 billion respectively, and though each will increase their expenditure, it won't be as high a percentage as expected from Apple. An October report suggests Apple is looking for new facilities for its original content push, and may have found a suitable property. Listed at $3.75 per square foot per month equating to a $3.8 million annual lease, the La Cienega Expo facility in Los Angeles is an 85 thousand square foot property previously held by a film props company. The facility's owner, Hackman Capital Partners, and Apple's alleged real estate broker Savills Studley, refused to confirm the reports. Apple Music costs $10 per month for individuals in the United States, but there is also a family plan that covers six users, priced at $15 per month, and a $5 Student plan. In June 2017, Apple changed the options available to subscribers, allowing individuals to pay for the service annually at a discounted $99, something that was only previously possible via a gift card. Currently, there is no sign of a similar discounted yearly plan for the family or student tiers. The Student plan was launched in 2016, granting students enrolled at eligible colleges and universities access to the service for up to 48 months. Originally offered in seven countries, the progrm has since expanded to become available in over 112 countries around the world. There is a three-month trial available for undecided users in most countries Apple Music is available, giving full access to the service for the period at no charge. In May 2017, Apple changed the terms of the trial for three countries to include a small fee of 99 cents in Australia, 0.99 euro cents in Spain, and Fr. 0.99 in Switzerland. It is unclear why the low charge has been introduced in these markets. Some carriers have also elected to offer Apple Music to its customers, as an incentive to sign up or renew their plans. For example, UK carrier EE offers six months of free Apple Music usage, double the usual trial period, with users then charged the standard Apple Music monthly rate once their free subscription has elapsed. While the bulk of the service, including on-demand content and the iCloud Music Library, is available only to paid subscribers, some features are still available to use without the subscription. Some Connect features are accessibe off-subscription, as well as streaming Beats 1 live, but not on-demand shows. Apple Music has garnered a considerable user base since its June 2015 launch, with Apple confirming the service exceeded 30 million paid subscribers as of September 2017. At the 2017 WWDC held in June, it was reported Apple Music had hit the 27 million milestone, suggesting its current growth is roughly at 1 million people per month. By comparison, main rival Spotify had over 140 million active users as of WDDC 2017, including both Premium customers and those on its ad-supported Free tier. Later in June 2017, Spotify confirmed it had breached the 60 million paid subscriber barrier, roughly double the number subscribed to Apple Music. In February 2018, a Wall Street Journal report predicts Apple Music will overtake Spotify in the United States. Unnamed sources claim Apple Music's U.S. growth is around 5 percent per month compared to Spotify's 2 percent, and if users in free or discounted trials are included, Apple Music already has a slight advantage. In March 2018, Apple Music had swelled to 38 million subscribers, according to SVP Eddy Cue. The service had acquired two million subscribers in little over one month, with anothr 8 million users currently listening to Apple MUsic on a trial basis. Spotify and Apple Music are believed to take the lion's share of the streaming music market, but there are other services out there that are still trying to compete against the main two companies. Google Play Music's All Access subscription provides a similar catalog of music for streaming for a comparatively similar monthly cost. Notably, the All Access subscription is also tied to YouTube Red, Google's service for allowing users to watch YouTube content without advertising in certain countries, an attractive proposition for heavy YouTube users. Amazon Music Unlimited gives Prime subscribers streaming music as part of the Amazon package of services, albeit with a small catalog of 2 million songs. A larger catalog is also offered for $8 per month to Prime subscribers, $10 for non-Prime users, though it is also possible to sign up for $4 per month if it is set up through the Alexa-powered Echo devices. Other notable competitors include iHeartRadio, Deezer, Pandora, and Tidal. In January, the existence of a new dashboard called 'Apple Music for Artists' was revealed, proving a way for musicians and bands to analyze their music's performance on Apple's streaming service, as well as for sales through iTunes. Initially rolling out to a fea thousand artists with a wider release expected in the spring, the dashboard offers key data on its homepage, including the number of plays, spins, song purchases, and album purchases, including a list of important milestones the artist's music has reached. Data can also be broken down by time, geography, and demographic, with this localized information able to assist musical acts in various ways. For example, it can help determine marketing plans for future songs, ideal tour locations, and even selecting which songs should be placed in which position on a setlist for a specific city's gig, based on local preferences. Apple expanded the beta to a wider number of artists in March 2018, and has started accepting requests to be included in future beta expansions. In October 2017, Facebook started to allow users of Apple Music to share tracks with their friends, usting a Messenger chat extension. Available in the Messenger iPhone and iPad app, users can tap the "Plus" icon at the left of the text entry field to access all available extensions, including Apple Music. Only Apple Music subscribers can listen to complete songs using the extension, but non-subscribers can still share and listen to 30-second samples. The extension also includes a prompt to encourage non-subscribers to sign up for the service. Messenger users can also search for "Apple Music" on the Messenger home screen to find a messaging bot, one that can provide artist recommendations to the user. The chat bot is even capable of providing recommendations based on the emoji sent to it by the user.